It is paramount to us to be good stewards of the Earth. When we remove a tree, we do our best not to waste any of it. The large pieces are milled into boards, the medium-sized pieces are used as firewood, and the small branches are chipped, and given to local farmers for animal bedding. Contact us to remove your tree. Whether you need a tree removed because it is dying or causing damage, our Eau Claire tree removal company will ensure it is safely removed from your property. Our equipment allows us to approach every job safety. We're able to reach tight spots and remove trees easily. We tether limbs and remove them with ropes, and then they're lowered to the ground with ease. A standard tree removal includes taking down a tree, chipping all brush, removing all of the logs, raking up any debris, and cutting the stumps as flush as possible to the ground. If you like, we can grind your stump as well. Call 715.256.7496 for a free tree removal estimate today! 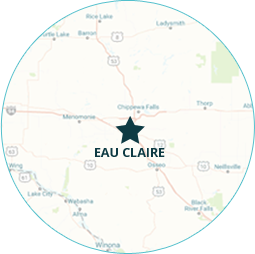 We offer tree removal services within 30 miles of Eau Claire. This includes Chippewa Falls, Altoona, Fall Creek, Menomonie, Osseo, and Cadott. We're hobbyists woodworkers. When we can save good wood from being thrown in a pile to rot, we do. We try to salvage as much as we can and mill the large pieces into boards to use on our personal woodworking projects. When we remove your tree, you have the option for us to cut it for firewood or haul it away. Instead of letting it go to waste, we sell it as firewood. Pricing includes delivery. Wood shavings for animal bedding provide comfort and absorbency. We offer free wood chip delivery in Eau Claire, Chippewa Falls, and Cadott. Talk to us about getting on our list for wood chip delivery! Thank you Trees2Treasures for doing a great job removing three large trees near our home. We so appreciate the extra care you took being the trees were so close to our house. You were very knowledgable and curtious. Plus, it was fun to watch! Thanks again. Thanks for removing the two large pine trees from our front yard. It's nice not to worry about the damage these trees might have caused every winter when they were weighed down with snow. My boys had fun watching you from the front window. Winter is the best time to remove a tree. Save 20% when you schedule in December - March. Copyright ©2017 Trees 2 Treasures | Website design and hosting by First Net Impressions, LLC.